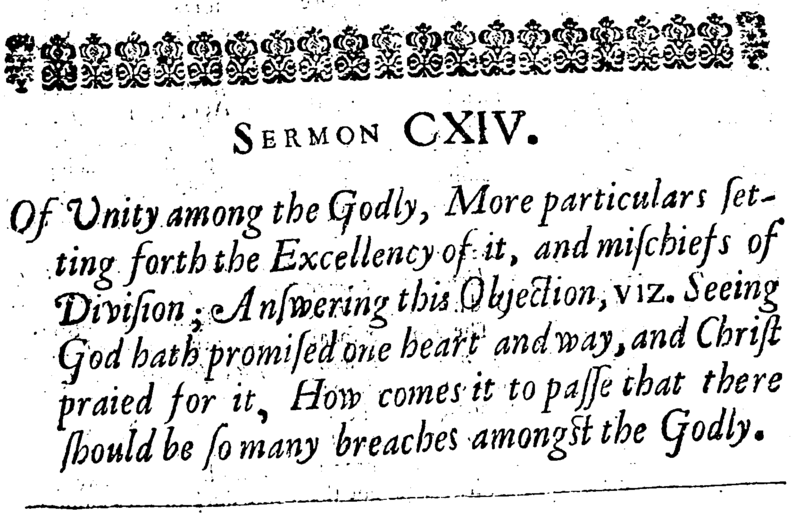 At the first General Assembly of the London Particular Baptists, held in 1689, the following question was proposed by a church and answered by the assembly. It is important for churches to recognize the gifts of the exalted Lord Jesus Christ (i.e., deacons and ministers–Eph 4:8-12). Having recognized such gifts, it is equally important for the church not to then throw them by the wayside or abuse them. Ingrown and self-blinded churches have turned away and thrown away good men for foolish reasons, and in so doing they have discouraged and dissuaded some men from the ministry, whether they are the candidates themselves or those who ponder pursuing the ministry. 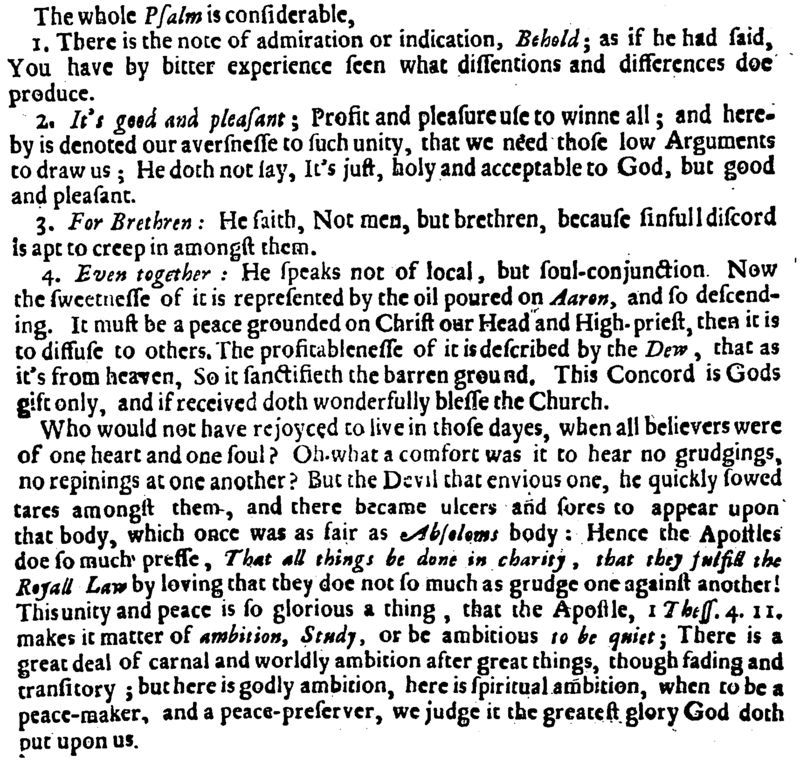 If one can say, as a very general observation, that Presbyterian ordinations can be overly mechanical, ordaining men who pass examinations but do not possess God-given and homegrown preaching and pastoring gifts, then it can also be said as a general observation, that Baptist ordinations can be self-serving, lazy, and overly demanding. The church as a whole needs actively to seek, recognize, pursue, promote, and prepare men for the offices of deacon and elder, knowing all the while that our King, Jesus Christ, will gift the same to his beloved spouse, the church. 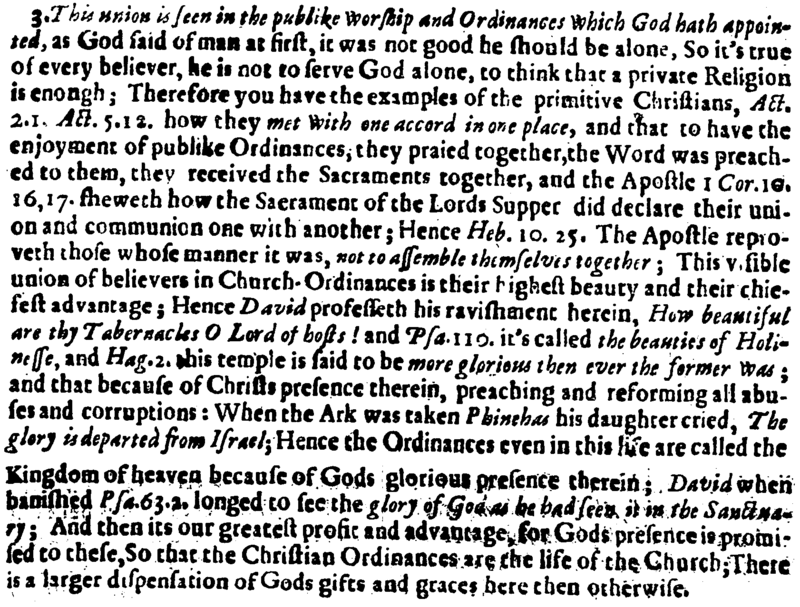 To do otherwise is “omission of an ordinance of God.” It is sin. 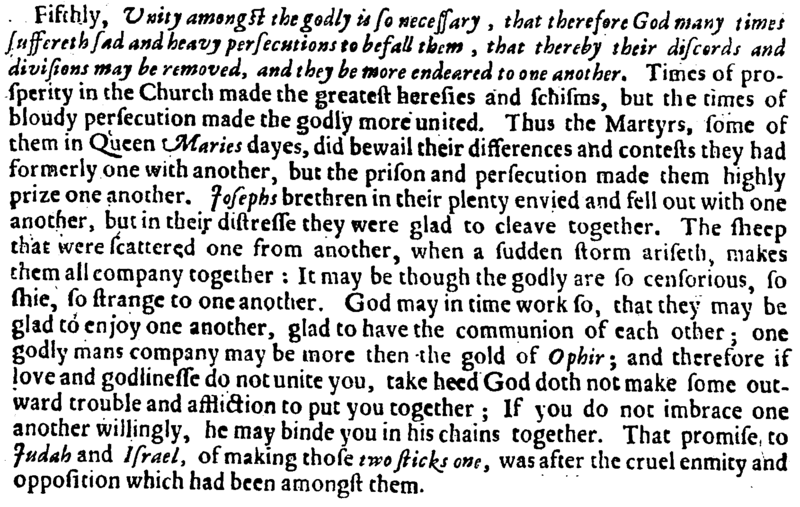 This concludes Anthony Burgess’ five sermons on Christian unity. The following is a continuation of the previous sermon, offering remedies for preventing or healing disunity in the church. Third, if we find ourselves holding a doctrine that differs from the church of Christ, we should exercise the utmost of caution in what we do, and especially what we say about it. Publishing our opinions to the world without careful consideration should be far from our minds. 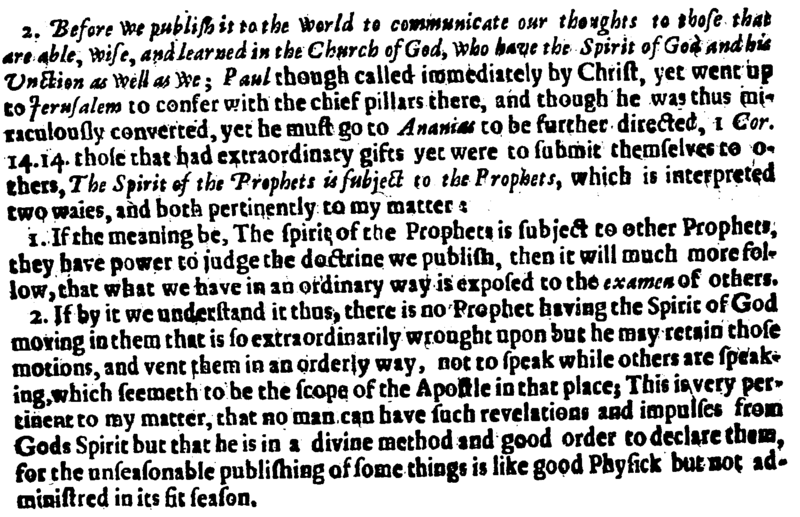 Before we publish an opinion which we know differs from the church, we should consult the teachers of the church. No matter who we are or what function or office we hold in the church of Christ, no one is infallible and no one sees the entire picture clearly. Consulting others adds accountability to our thoughts before we publish something which we cannot take back. Not all schisms are doctrinal. 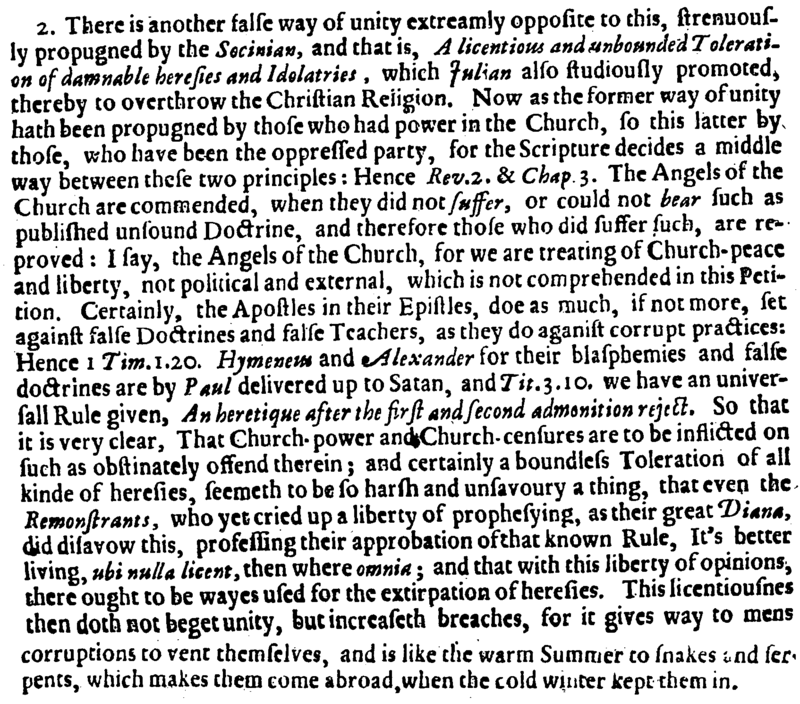 Sometimes those who hold the same doctrines leave churches and begin new ones in a breach of order. This is sinful and unacceptable as well. Be sure that if you leave a church it is for doctrinal aberrations at the most fundamental levels, and not merely personal preferences. “Do not thou leave it till God leaveth it; Do not thou unchurch it till God doth.” And before we leave, do all we can to heal the evils we see in the church. That may result in you being asked to leave, in which case your conscience is clear that you did not simply walk away without effort. There are good schisms and bad schisms. Dividing from a unity based on evil is a good schism. Dividing things united in truth is a bad schism. When there are problems in administration and government, do all that you can within the capacity of your calling. And leave the rest in God’s hands, patiently waiting and humbly enduring for the sake of the church. To prevent schism, we must root out pride in our hearts. Many have split the church because they did not get what they wanted. 1. Where there are differences, we must deal fairly with the disagreeing party. This requires both parties to state their positions clearly, so as to be understood positively and negatively (i.e., where there is agreement and disagreement). 2. We should prize the doctrinal accountability of an association, and we should prize the wealth of teaching gifts within an association. Beyond prizing these things, we should take advantage of them and submit ourselves to them. 3. We should defend the fundamentals (that which we confess), and avoid disputing the rest. 4. We should root out pride, promote humility, and pray to God that he would give us one heart established on one faith immersed by one baptism serving one Lord in one Spirit. Let our unity begin and end with Christ, his truth, his commands, and his ways. 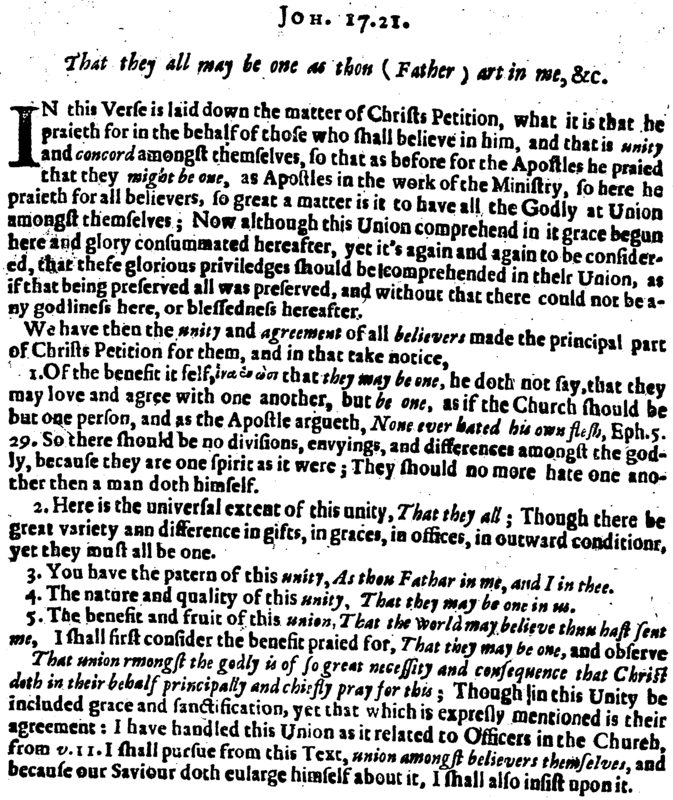 We have come to part four of five in Anthony Burgess’ sermons on Christian unity. 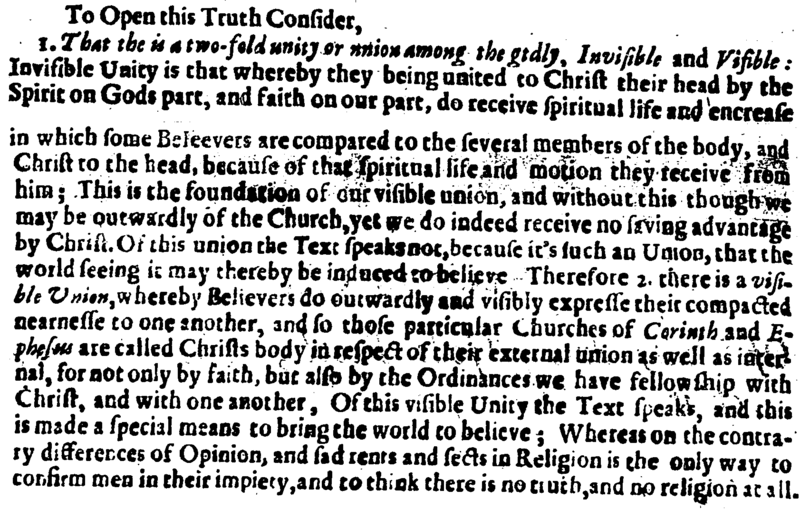 Having dealt with the necessity and nature of unity, as well as the mischief of division, Burgess now offers us some cautions concerning how unity should be pursued, and how it ought not to be pursued. He also provides helpful thoughts on dealing with disunity. That being said, our unity is to begin and end with Jesus Christ. But it is not just a common profession of faith in Jesus that unites his people. It is also a common obedience to all of his teaching, his commands, and his ways. Christ as King is to be the fountain of our unity. This simple fact makes the unity of hell, the world, and the Roman church to be sinful wicked and abominable unities. Our unity must be manifested in orderliness, according to the Scriptures. 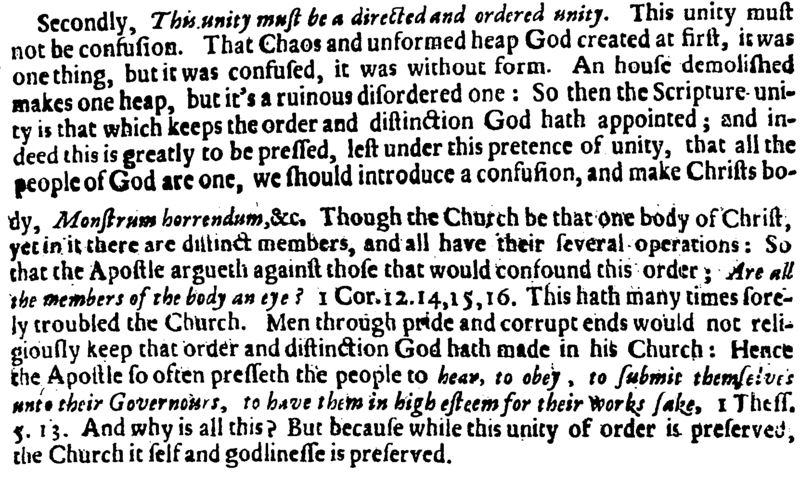 If our unity is built on Christ and his commands, and if Christ has left us complete instructions for the government of his church, then our united obedience to his commands should yield a united and ordered church. 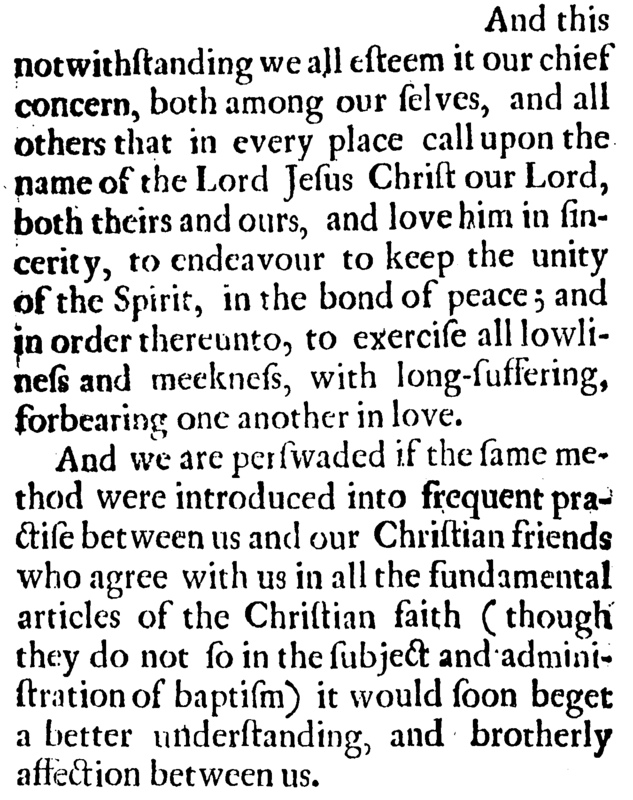 This ordered unity under the authority of Christ is consistent with things which might appear to foster disunity. For example, someone who is willing to oppose falsehood and stand for truth in the church may appear to be promoting disunity, but they are actually being faithful to Christ and his commands, as well as faithful to the unity and order of the church. 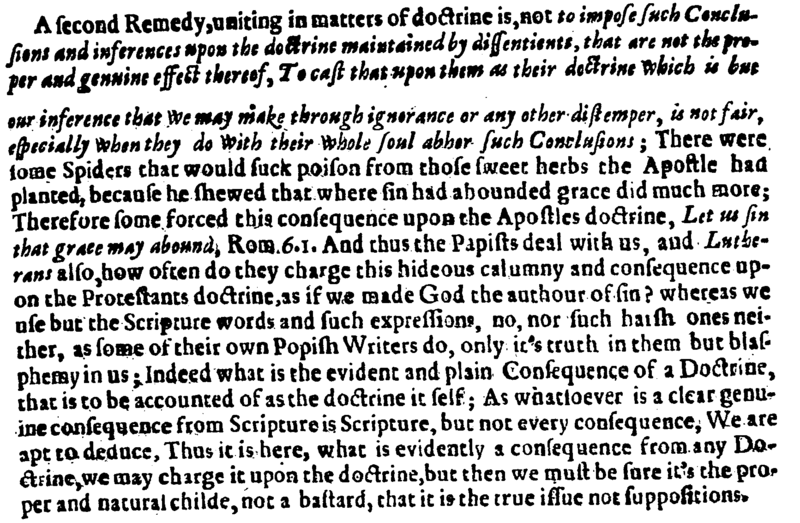 It’s true that doctrine divides. It divides light from darkness, truth from falsehood. 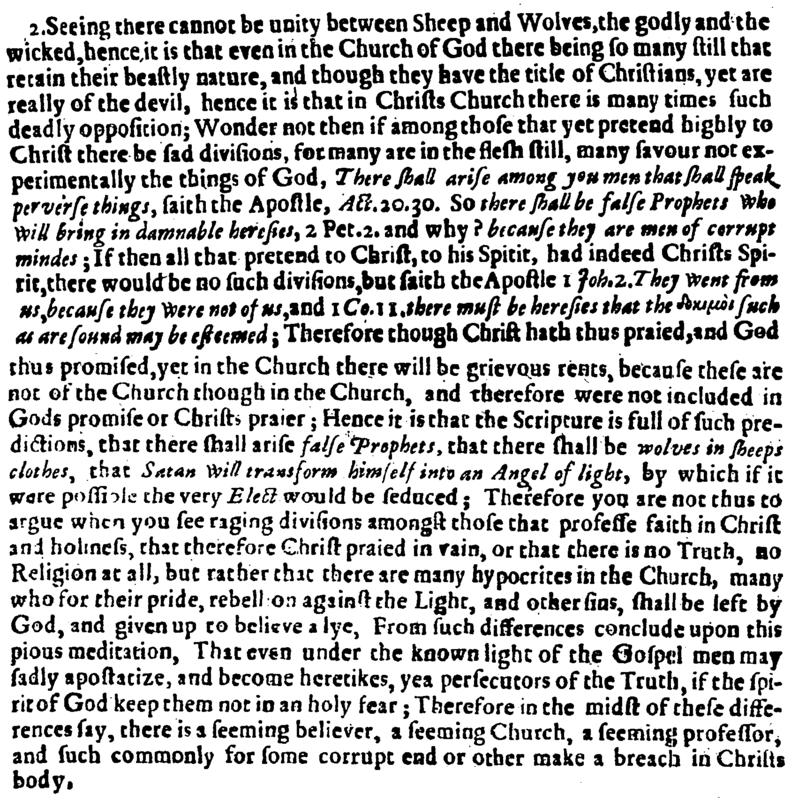 “For he that is pitiful to the wolf is cruel to the sheep.” And “So there is a counterfeit disguised unity and love, and that is, when because of this peace and agreement, no damnable heresie, no corrupt or evil way is to be severely dealt with, and a Scripture-way taken to stop the progress of it.” Unity must be built on Christ’s truth and his commands. 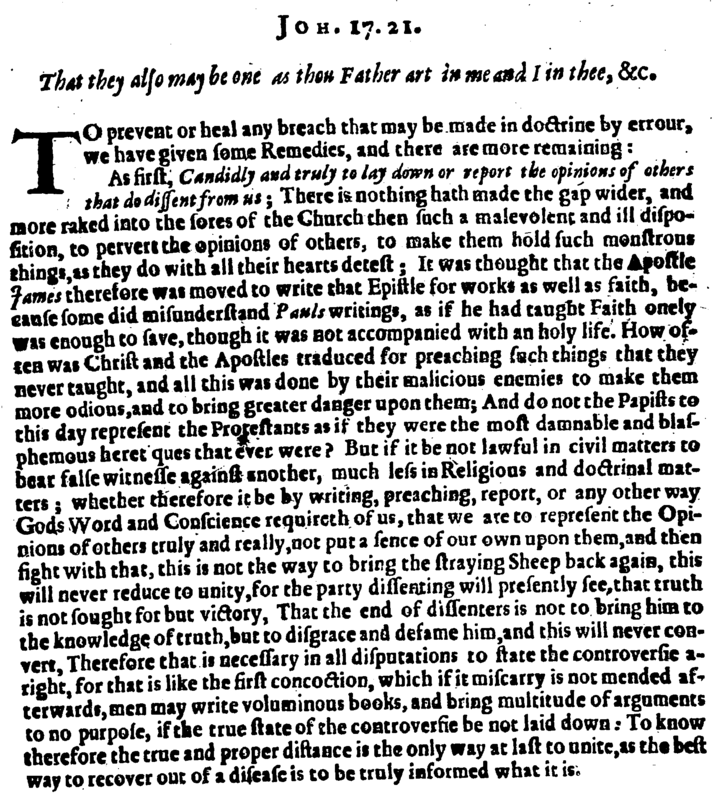 “Be then fully persuaded, that the unity and love Christ prays for, does not oppose Scripture-zeal, and courage against any profane and erroneous ways: It does not bring in a compliance and symbolizing with all heresies and profaneness.” To fail to stand firm against error is to promote disunity, or at the least a sinful and unbiblical unity. How do we deal with disunity or breaches in unity? There are two ways, extremes, proposed: The Papal way and the Socinian way. 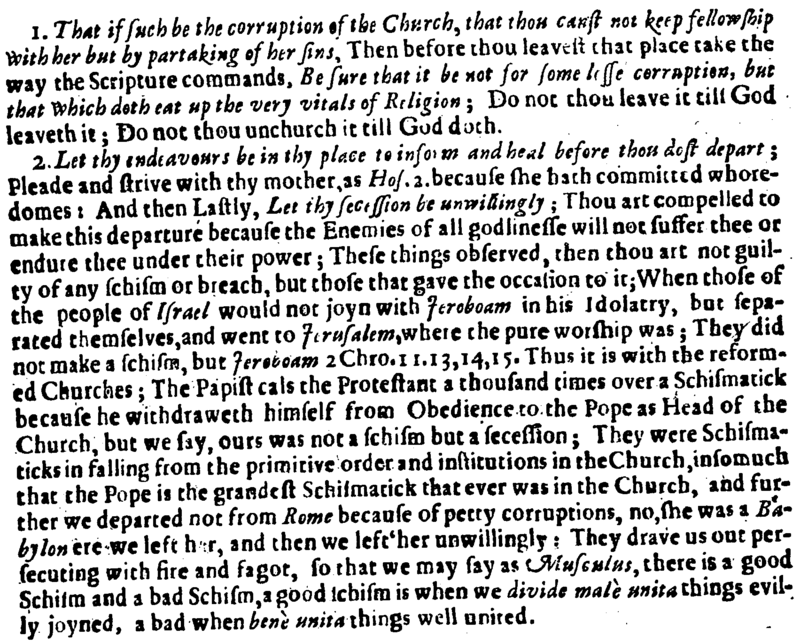 The papal way imposes all belief and allows no dissent. The Socinian way allows anything and everything (except the truth). 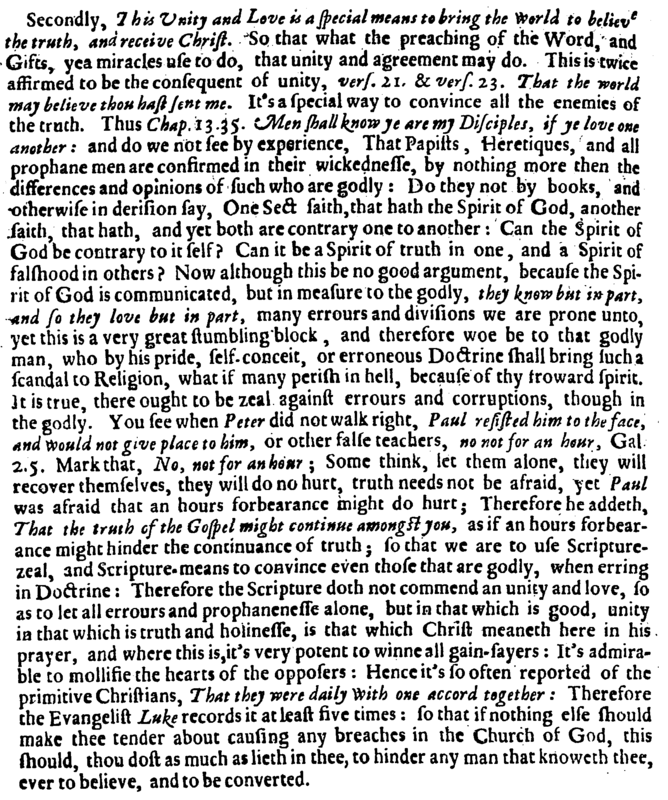 The right way forward, according to Burgess, is to build unity on three things: True doctrine to remedy heresy, True order to remedy schism, and true love to remedy wrath and contention. Wherever you agree, agree heartily and stand firm and fast on that doctrinal agreement. Submit to biblical authority in the church. Church members are to give due reverence to their ministers, recognizing that their authority comes from Christ. We should give great weight and consideration to the teaching that comes to us from Christ’s ministers. And we should value it much higher than our own private opinions (while acknowledging all to be under the authority of Scripture). 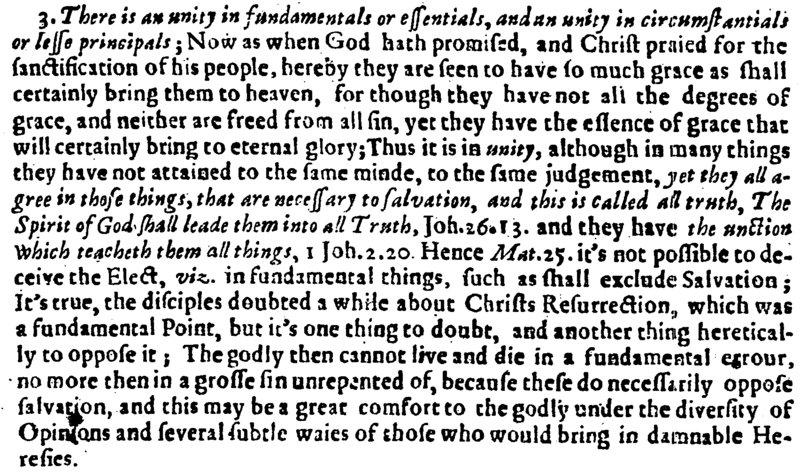 Thinking in an associational context, there is much wisdom to be gleaned from Burgess’ comments. 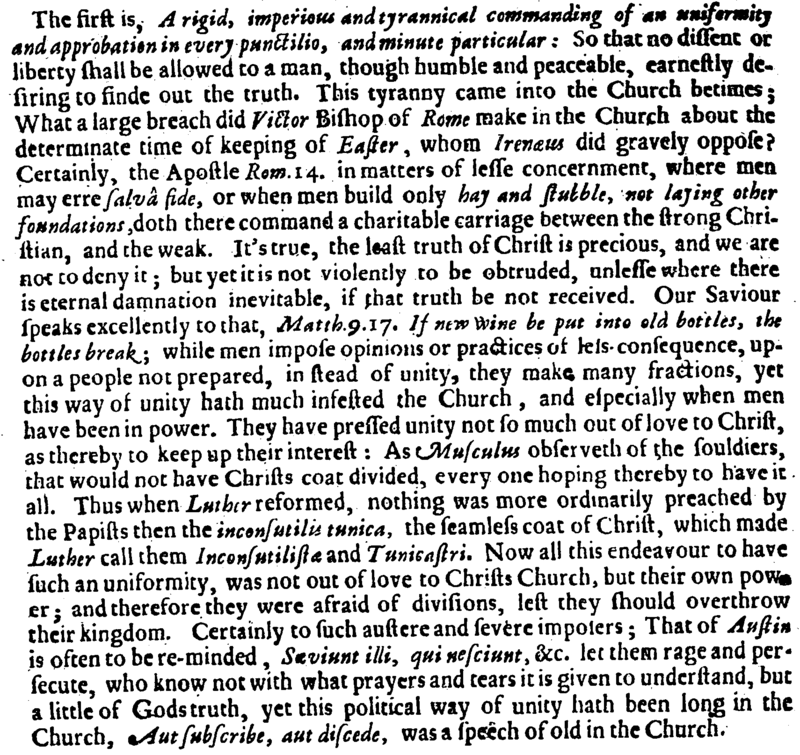 For example, between the tyrannical imposition of Rome and the licentious liberty of Socinians stands a voluntary confession of faith by the people of Christ as churches of Christ. In this model, no belief is imposed. Yet each person/church is held accountable for what they have confessed to be true. Thus, while the conscience is not imposed upon by any external compulsion, it is still guarded and bounded by external and mutual vigilance and accountability. Furthermore, a confessional association can mutually agree to establish sanctions or means of redress when a breach of confessional integrity arises. This strikes a perfect balance of unity built on Christ’s truth and commands without the tyranny of Rome, the license of Socinians, or the toothless doctrinal accountability of non-confessional “associations” of whatever kind. 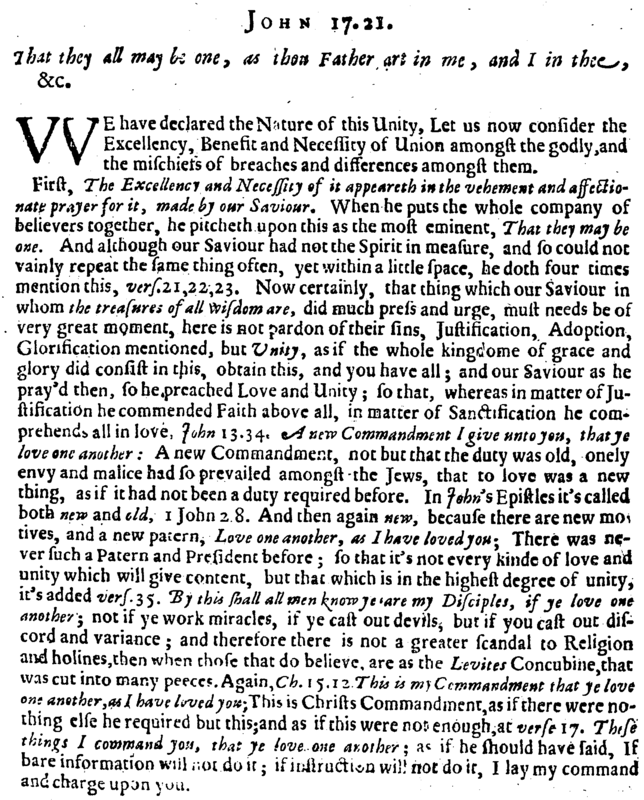 This is a continuation of Anthony Burgess’ five sermons on Christian unity. 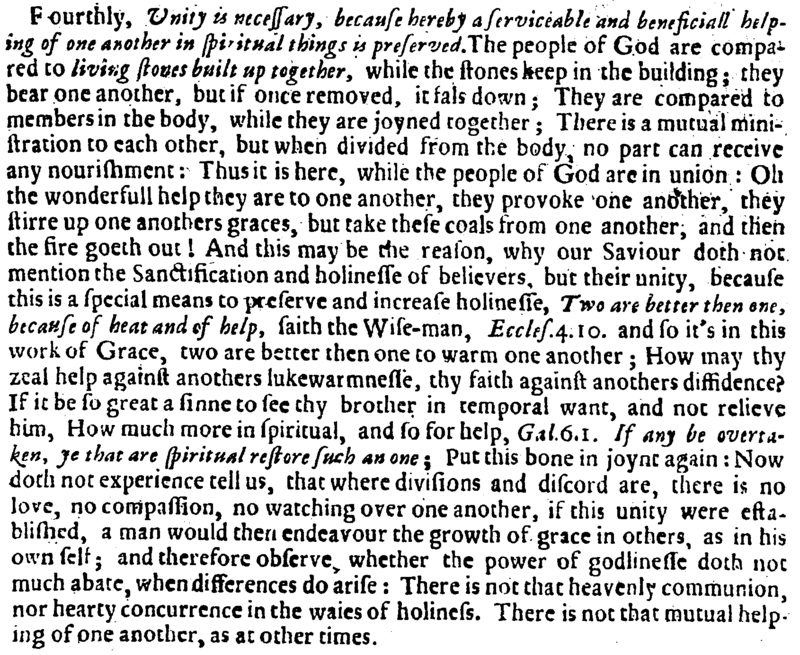 It is also a direct continuation of the previous sermon, describing the benefits of unity and the mischief of division. 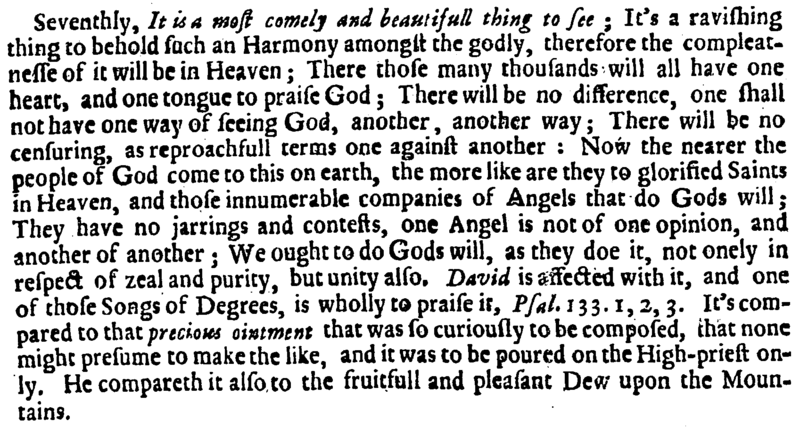 In the ensuing passage, Burgess argues that unity is of utmost importance. The Scriptures demand and declare it plainly. And we must strive for unity. 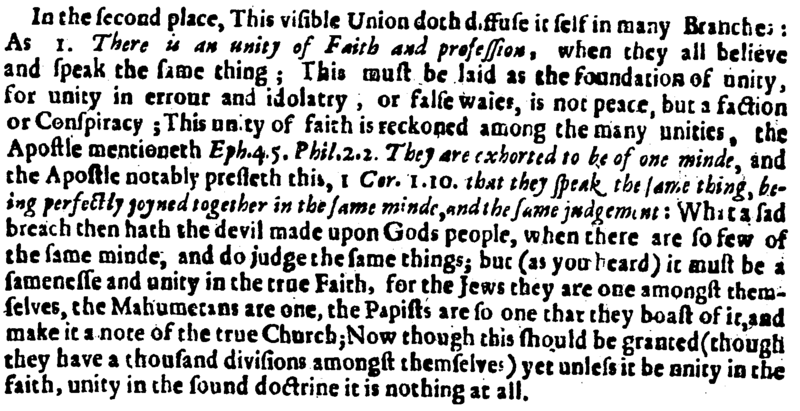 If the devils can unite against the church, cannot the church unite against the devil? There is one Lord, one faith, one baptism. If all this is true, how do we account for our disunity? First, our unity immediately implies a decisive and complete rupture from the world. Division is necessarily entailed in our unity. 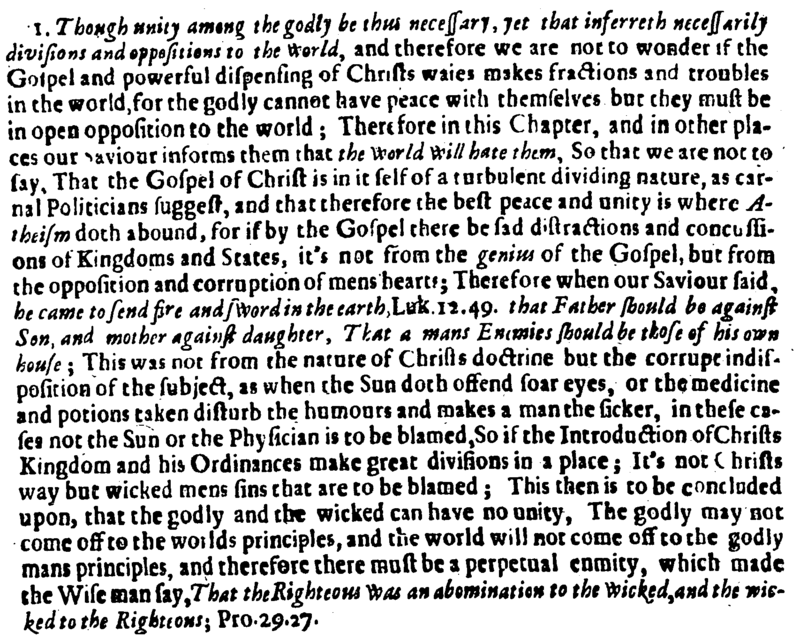 This comes about not because of some defect or intentional disruptiveness on the part of the gospel, but rather natural man’s enmity towards God and hatred of his truth. It is the remnant of sin, either within believers or found in false believers, that causes divisions and disunity in the church. 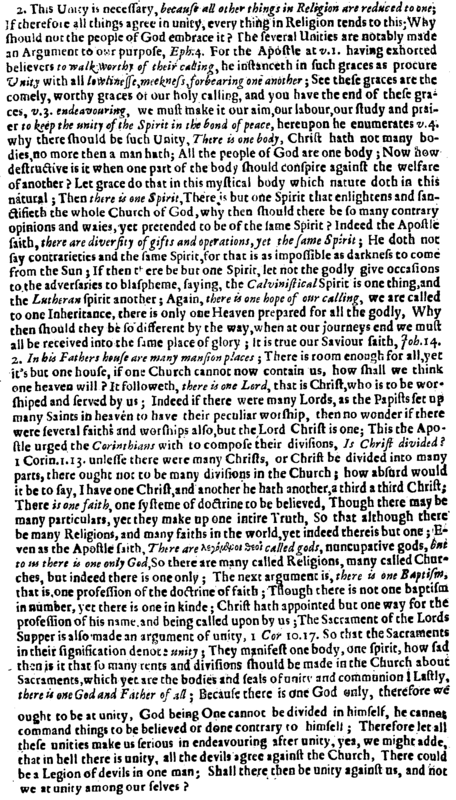 Divisions are evidence of the false church within the church. If the elect cannot be deceived in fundamentals, ultimately, then a fundamental agreement is to be sought after and considered more than non-fundamental agreement. We should also remember that Christ’s prayer will be fulfilled at last in heaven when we are truly all one in every respect. As long as we dwell here in this sinful world, and as long as sin dwells in us, we should expect a certain amount of division and disunity. And we ought not forget that the Devil is hard at work, though he will never triumph, to subvert and disrupt the church at every turn. Associations of churches should not be surprised when disunity arises. But they should take action, carefully and collectively, to deal with divisions so that the truth and love of God rule the day and form the foundation of our unity. 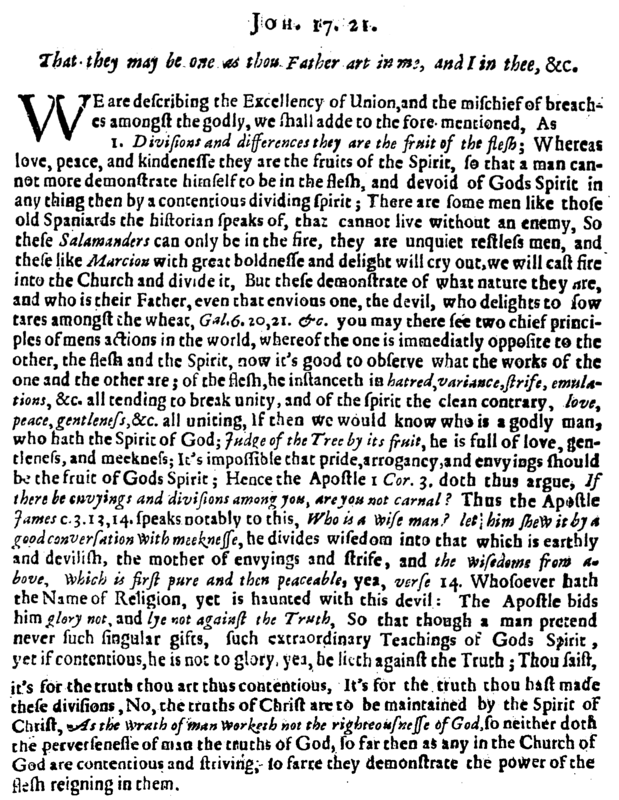 Continuing on in Anthony Burgess’ five sermons on christian unity we come to his exposition of the benefits and necessity of unity, as well as the mischief of division. His previous sermon dealt with the nature of unity: invisible through the Spirit, visible through confession of faith, church ordinances, government, membership, and ministry. 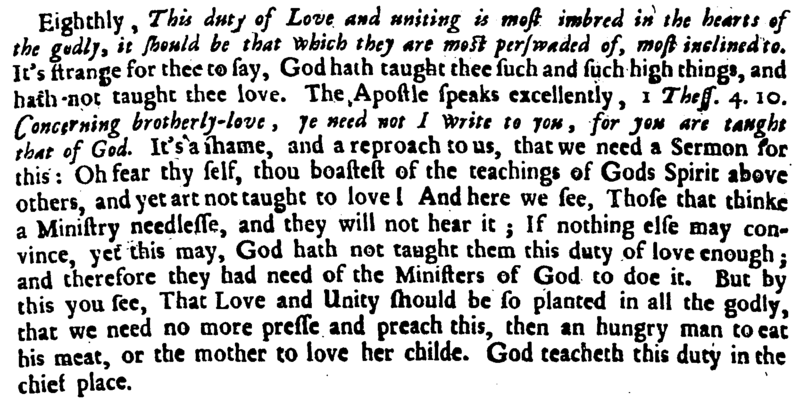 One of the excellent features of this sermon is Burgess’ balance of unity in love and doctrine. Those two things should never be placed in antithesis to one another. 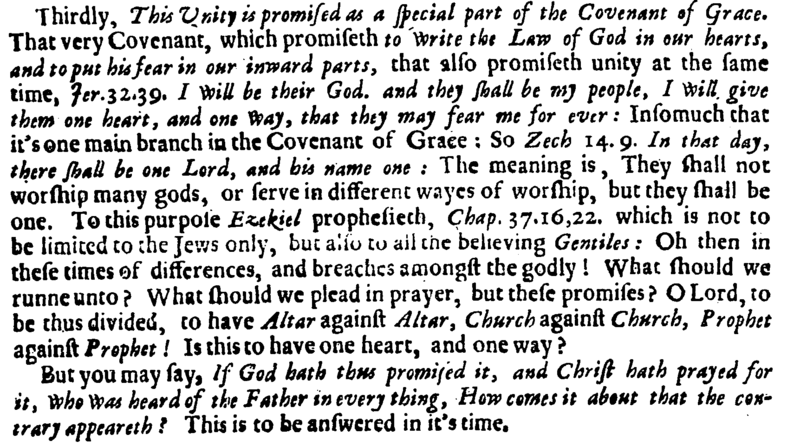 We have been promised unity in the covenant of grace. Therefore we should pray for it, expect it, and pursue it. Why then so much division? 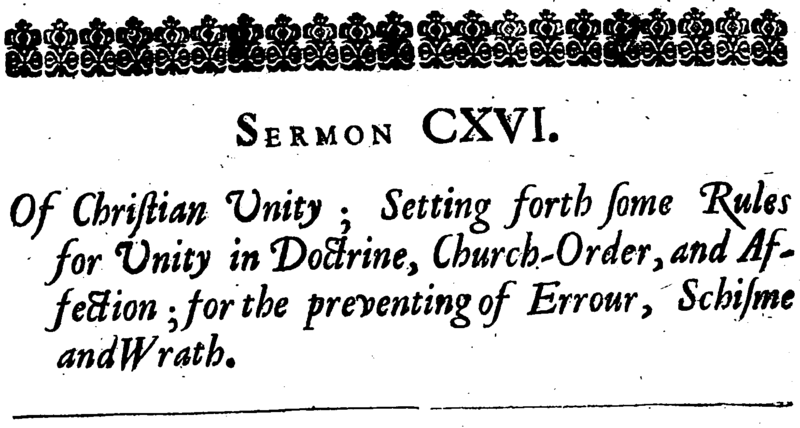 Burgess will deal with that in another sermon. True unity is a beautiful thing to behold and to experience. Unity is so beautiful that we must all strive to be peacemakers. We should love and long for unity to such an extent that it is our natural inclination and desire in this life. We need Scripture and ministers to remind us, but let us take it to heart and pursue it from our own hearts’ compulsion not purely a mandatory obligation. In the previous post, I mentioned that Burgess’ sermons are excellent material for associationalism. 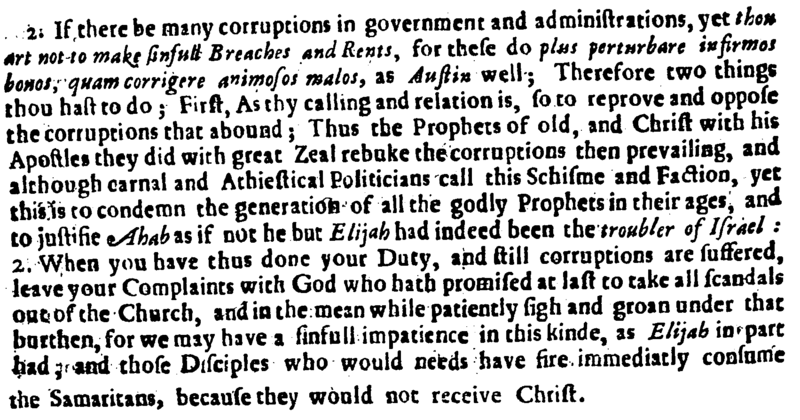 All of that remains true in this sermon. Christians have an obligation to join with other Christians, first in local churches, then as local churches. This unity is to be built on truth and love, and it its strength and beauty will grow as we stand firm on that foundation. Thus built up and solidified, we can help each other and accomplish much good, with God’s blessing. And we will be a strong testimony to the world of the life-changing power of God’s grace, and the fulfillment of the promises of the New Covenant. 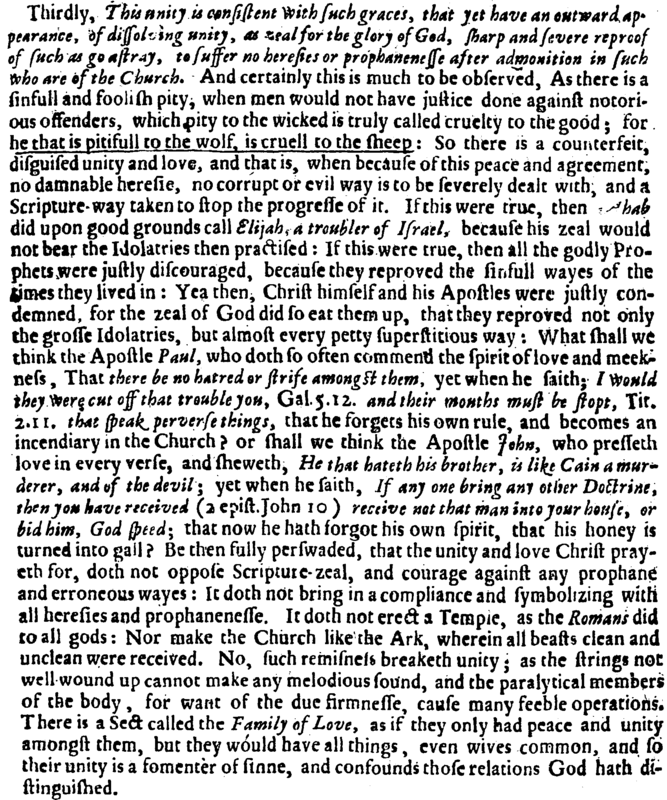 Anthony Burgess, a member of the Westminster Assembly, preached CXLV sermons on John 17, five of which were concerned with the topic of unity among Christians. This is the first of those five. It is well presented and well worth reading. I also find this material, including the subsequent sermons, to be excellent arguments and information for the practice of associationalism (although Burgess of course would not have taken it in that direction). 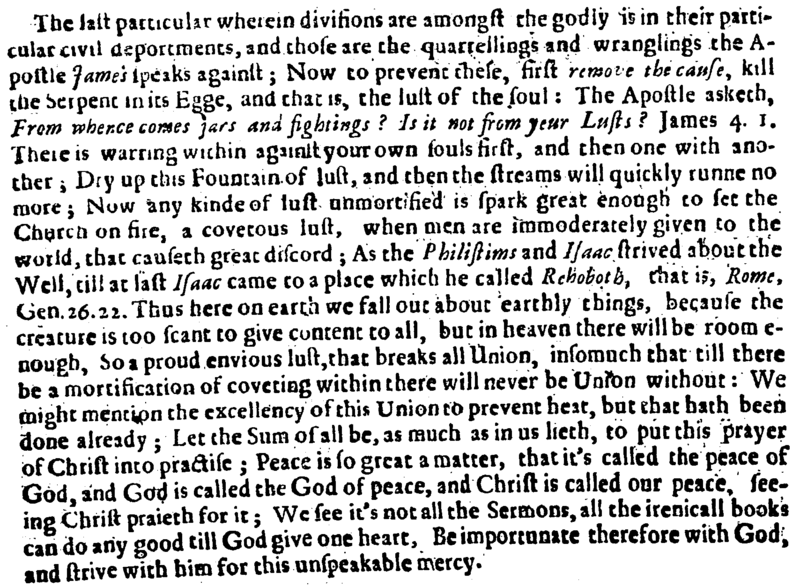 The fundamental doctrinal assertion of this sermon is in italics below: “That union amongst the godly is of so great necessity and consequences that Christ doth in their behalf principally and chiefly pray for this.” Unity is important, and necessary. We must pursue unity. 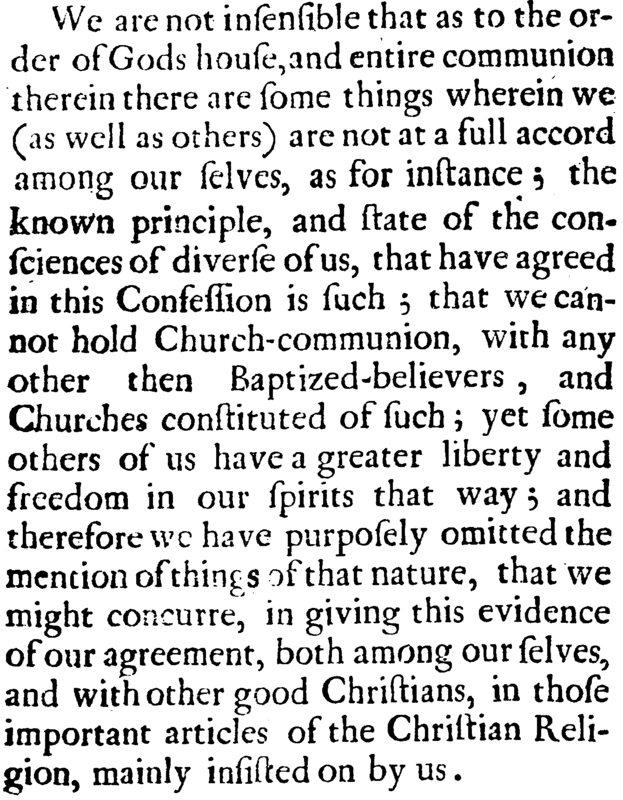 And, as Burgess argues, this unity is fundamentally built upon agreement. 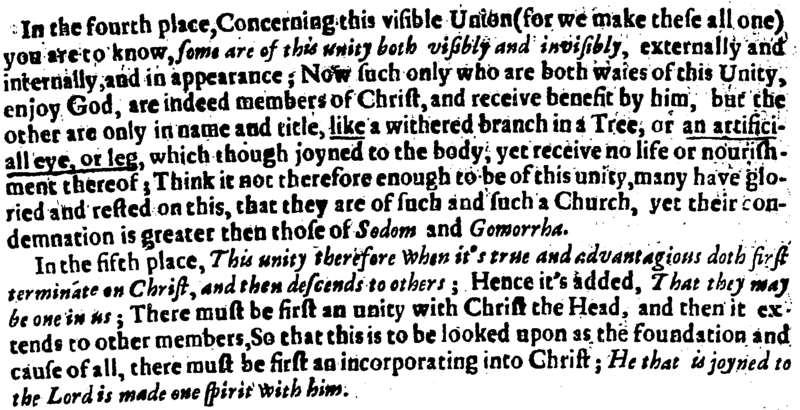 Burgess proceeds to distinguish between invisible and visible unity. Our invisible unity comes from our union to Christ through the Holy Spirit. This invisible union is the foundation for our visible union. 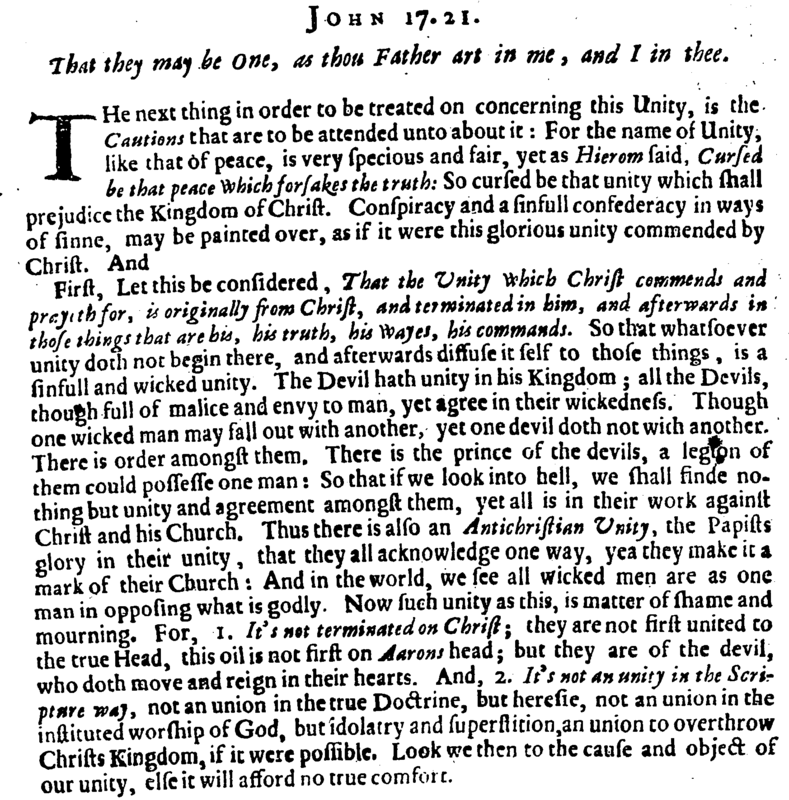 Christ’s people establish visible union by “outwardly and visibly express[ing] their compacted nearnesse to one another.” Such a visible unity is one of the chief testimonies to the world of Christ’s church, and conversely all divisions and ruptures are a blight on this otherwise beautiful picture. But what does this visible union look like? It is first of all, and above all, a unity of faith and profession. 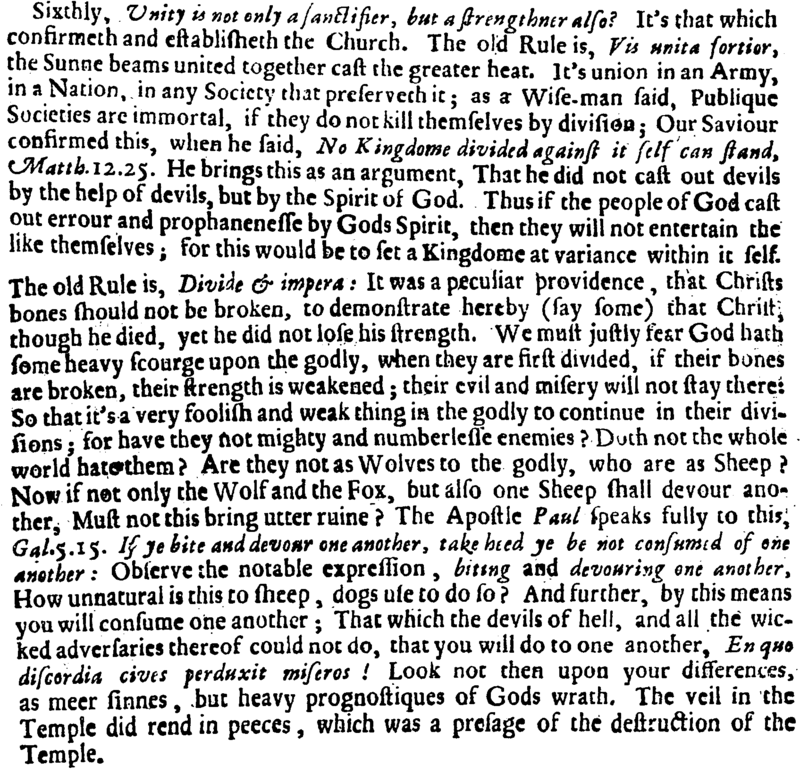 It is a doctrinal unity, “for unity in errour and idolatry, or false waies, is not peace, but a faction or Conspiracy.” Apart from unity in faith and sound doctrine, unity is worthless, meaningless, and useless. 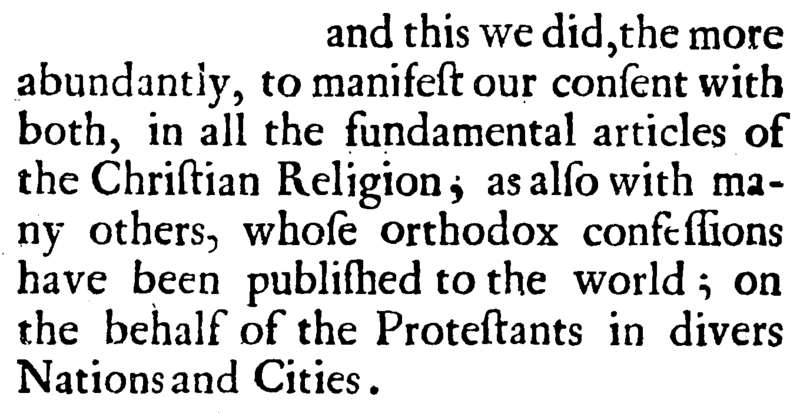 But Christian unity is much more than simply collective intellectual concordance. We are to be sincerely and deeply concerned for the being and well-being of our brothers in Christ. If we are brothers, God’s children, how can we ignore our spiritual siblings? This union is visible in churches. Rogue Christians who will not join the church either are not Christians (because they intentionally reject Christ’s commands) or they are unwittingly destroying the church’s unity under some false delusion of doctrinal deviation which they think keeps them from joining the church. When we gather to worship, hear the word, and partake of the Supper, we collectively hold fast the confession of our hope and proclaim the Lord’s death until he comes. Within the church, visible unity plays out in a biblical order of church government. Each member ought to play his or her role faithfully, complementary to the rest. Visible unity also produces a people who help one another and share a common pilgrimage and exile while waiting for our eternal inheritance. There is also a visible unity within churches and between churches wherein they cooperate for the advancement of Christ’s Kingdom. These things being premised, we should understand that the invisible unity of Christ’s people goes far beyond any boundaries of visible unity we may have established for doctrinal or practical reasons. And we ought to pray for the church throughout the world. Visible unity means that there will be some false professors who are not truly of the church. And because our unity begins and ends with Christ, such individuals not only do not share in Christ, but receive greater judgment for their false profession and apostasy. However far away we may be from other believers and churches, let us pray for the church around the world. 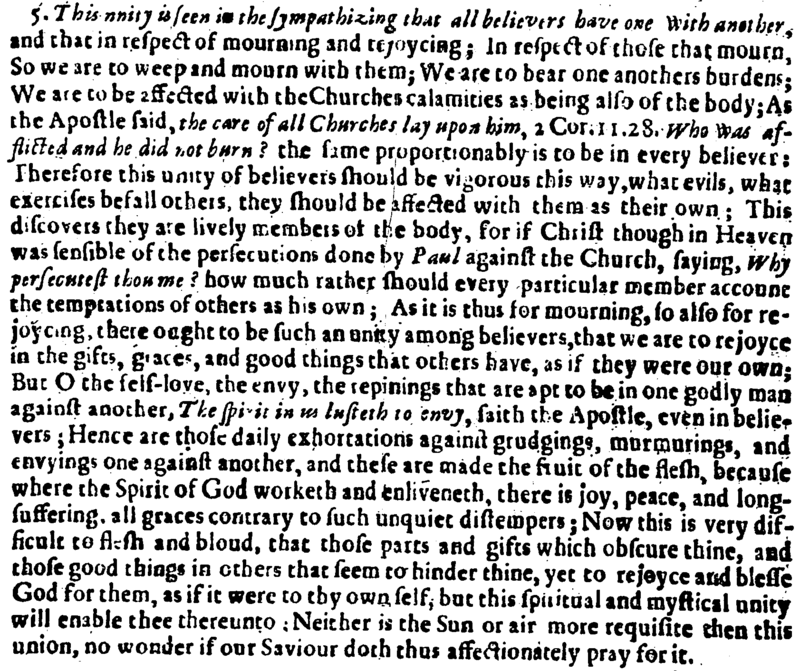 Application: If Christ prays for the unity of the church, let us strive for the unity of the church. And because unity is fundamentally built upon the truth, let us eschew division, departures, breaches, and differences among the body of Christ. Let each one examine himself and be sure that we are contributing to the unity, not the disunity of the church. Associationalism is essentially the idea that because there is one church, the family of God, therefore each individual visible manifestation of that one church ought to be deeply concerned for and cooperating with other individual visible churches. This is confirmed by the example of the apostles and the early church. Thus, while no church can impose beliefs or exercise authority over others, the churches ought to join together under a voluntary, mutual, sincere, collective, and common profession and confession of the faith. And in this way, confessing the faith together, we present a united front of doctrine and practice to the world.